Keeping our synchronization with the development taking place in this industry, we are engrossed in delivering a broad range of JK Cedar Paper. We are one of the leading traders and suppliers, offering a comprehensive array of high-quality Alabaster Paper. 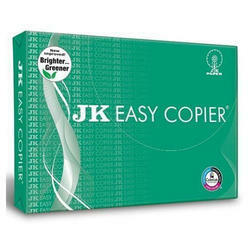 It is widely used in the offices and the stationery shops for Xeroxing purposes. These are well known for their high tear strength and smooth finish. Owing to their user-friendliness, optimum durability and attractive designs, these are highly demanded by the clients in the market. Firmly backed by a reliable business associates, we are engaged in offering a premium array of copier paper. These are used for taking notes, writing official letters and for preparing official documents. Creating new benchmarks in the industry as one of the leading organizations, we are engrossed in offering Copier Paper.